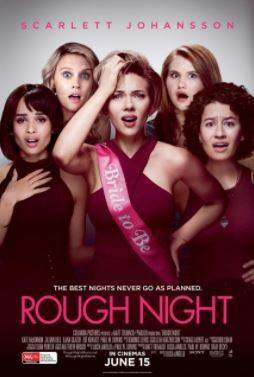 Rough Night is now showing in cinemas everywhere and is distributed by Sony Pictures. Designated chick flick Rough Night takes obvious inspiration from a host of other party comedies so much that, not surprisingly, it struggles to find it's own personality and original laughs. Yet, the film has some hidden gems which should not be ignored and should be celebrated. Party films are almost a comedy sub-genre of their own. With the number of bachelor and bachelorette party films we have seen in the past decade, it is no surprise that Rough Night looks and feels a little familiar. Taking it's inspiration from films such as Bridesmaids, The Hangover and Weekend at Bernies (though not of this decade), the story of five women who travel to Miami for a bachelorette weekend is painstakingly predictable. Every turn their journey takes is unoriginal as are the accompanying jokes. For the large part of it's 101 minutes, Rough Night throws around obvious situational gags with a painful sense of desperation. Yet, it does not completely fail to generate laughs, there is just perhaps less than there really should be. There are certainly some very funny moments throughout Rough Night, many of which come courtesy of Kate McKinnon, who plays Australian girl, Pippa (with a very interesting accent that often sounds as though she is part Kiwi...which is unintentionally amusing as this is one of the running jokes). McKinnon steals every scene which she is in as her comedic timing is unrivalled by any other cast member. However, there is much about Rough Night that should be celebrated. Despite is downfalls, the film is a strong female driven piece of work that does more than just place five females as the protagonists of the film. From the outside, it may not seem that Jess (Scarlett Johansson), Alice (Jillian Bell), Blair (Zoe Kravits), Frankie (Ilana Glazer) and Pippa are strong female characters, as the plot calls for them to go a little crazy and get a bit messy. One must remember that this is a bachelorette weekend and it's naïve to think that girls would act any other way on such a night. Yet, once mayhem enters the scene, it becomes obvious that the male characters are the weaker link. Scarlett Johansson's Jess is the strong centre of the film. She is obviously the one who wears the pants in her relationship and in the middle of a political campaign that demands her attention. Her to-be-husband, Peter (who is played by co-writer Paul W. Downs) is aware of the lower ranking he holds in the partnership and is nothing but supportive of his fiancé's decisions to work on her career rather than romance...whether he likes it or not. Their relationship very much represents a new-age marriage in which the woman is ambitious and the man is the unwavering support. The non-platonic rekindled love affair between Blair and Frankie is also refreshing. The theme of female empowerment we obviously see here also includes the importance of females empowering one another. Women can be nasty creatures to one another and Rough Night demonstrates how horrible women can be to each another, but also how working together produces amazing results. Rough Night is not a triumph of it's genre and it is a shame that a film with a positive message for women will likely be forgotten within months of it's release.